» The Goonies Lights! Camera! Vegan! The Goonies is one of the most beloved 80’s movies of all time that i’m sure you’ve all seen 5-500 times, but for the sake of putting down words: Some douchebuckets are going to tear these kids’ houses down so they can expand their country club, and after finding a treasure map in Mikey’s basement they decide to go find this treasure because what else are you going to do on what is possibly your last day together? Play Scattergories? Not tie your brother to a chair with his own workout equipment? Pass! Of course, there can’t be a treasure hunt without a family of murdering criminals and the deformed guy they keep in the basement, older brothers, stupid jocks, and bats. But it’s all worth it for the badass pirate ship! Did you know that the pirate ship was 100% real? All of the inside shots were also from the ship, not a set. When the movie was finished, it was demolished because no one wanted to take it home. I have never been so disappointed in the human race as when I learned that no one wanted a FREE PIRATE SHIP. Starring Corey Feldman (all of those other awesome 80’s movies, Ascension Millennium), Sean Astin (some movies about walking, Rudy), Josh Brolin (Planet Terror, Jonah Hex, Men In Black 3), Anne Ramsey (Throw Mama From the Train, Scrooged), Joe Pantoliano (The Matrix, The Sopranos), and Robert Davi (Die Hard, Profiler). Entrees: Mouth may have been an idiot, but he had the right idea in asking for (Seitan) Scallopini and Fettuccine. If you expect to run around in underground tunnels all day, you need to carbo-load. Desserts: You can make easy Rocky Road Brownies, or you can make your own Baby Ruths to throw at people. P.S. 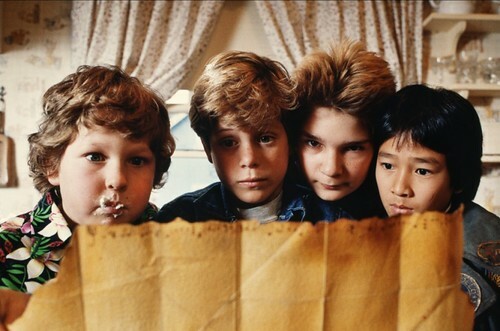 I love it so much that someone made vegan Baby Ruths in homage to The Goonies, specifically. Normally I don’t ask for specific comments, but please leave your favorite Goonies quotes in the comments so I can quote back at you and we can nerd nerd nerd. Veganism is just a red herring. Halloween movies, ready to go! © Katie Hubbard and Lights! Camera! Vegan!, ‘2019’. Unauthorized use and/or duplication of this material or images without express and written permission from this blog’s author and/or owner is strictly prohibited. Excerpts and links may be used, provided that full and clear credit is given to Katie Hubbard and Lights! Camera! Vegan! with appropriate and specific direction to the original content.